Decades plays hits from everyone’s favorite eras of music! Favorites from the 60′s,70′s, 80′s, 90′s, 00′s to today. All the hit songs, every time to please allmusic fans. Decades can also CUSTOMIZE a set list for you to ensure you get the performance YOU WANT !—Motown ,rock,country,blues, pop, and dance—all high energy live music! Decades is more than a cover band—it’s the Ultimate Show. 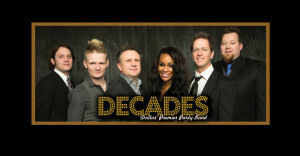 Decades is THE premier variety show band, playing your favorite music hits ! We specialize in corporate events, wedding events, and birthday parties. Decades can change costume and transition into an 80’s Show band. Decades plays a great mix of hit songs broken up into non-stop blocks as well as full hits songs through the years. The end result is similar to a DJ spinning songs with no breaks in-between songs so that the fun doesn’t stop! From new wave ,disco,country, pop,r&b,,rock, to hair metal, Decades covers all of your favorite music hits from the 60′s, 70′s, 80′s, 90′s to current —CUSTOMIZE your show for the Ultimate Experience. We also provide a “QUIET” dinner set of music for yourwelcome/dinner needs.Our sound system is state-of-the-art and flexible from small rooms to the largest indoor/outdoor venues .Music you can talk and eat while listening . If you’re looking to CUSTOMIZE the Ultimate Show for your wedding, high school reunion, party or corporate event anywhere.